I have a confession: I am a Blogging Dinosaur. Believe it or not, I remember when Instagram was new and blogging wasn't a paid gig. And if I really want to date myself, I remember where I was when I officially set up my very first Facebook page....yikes. Anyway, my point is that I've been around a while and I've seen it all, including the rise of social influencer monetization. Truth be told, I love that there is a wild side of blogging that includes turning your passion into a business. Even better, if monetizing is your goal, it can absolutely be achieved by anyone who works hard to hone their craft. But the key word here is "work" - I'm often asked (often as in, daily, sometimes hourly) how to make money as a blogger, how to work with brands or how many followers an influencer needs to start monetizing. To me, the answers are simple and they may be things you haven't yet considered. Monetizing your blog is a business venture - a brand or company is hiring you to represent their product. For that partnership to be successful, you each have to bring something to the table. The brand will bring their product and, hopefully, their checkbook and you'll need to be prepared to provide them with something marketable in return. And what might that be? Content, content, content. Do you have it? Are you writing and publishing blog posts regularly? Do you have a post log that reflects that you've put thought, time and effort into your site? If not, I suggest spending a month producing high quality posts that reflect the topics you love to write about. With those posts published and promoted on social channels, you'll build page views (bonus!) and an opportunity for a brand to get to know your work and, ultimately, your value. 2. Stats are important, but not just the ones you think. I get it: Instagram is the current king of social media. But Kings fall and Instagram is not the platform it once was. Do you have a following on Facebook, drive traffic to your blog via Pinterest or have a strong Twitter presence? You should say yes to all of those! Focusing on one social platform means that, at any given moment, your followers may no longer be reminded to view your site - and without page views, you simply don't bring anything to the table for a paid partnership. I'll be honest and use myself as an example: I have 16,000 Instagram followers, which to some is a lot, but to many is an mediocre following, but my blog averages 80,000 page views a month per Google Analytics. I bring a lot more to the table than my Instagram following, including a super active Pinterest page and strong Facebook community. By building your communities, engaging, sharing and participating on all social platforms, you'll be upping the ante on what you bring to the partnership table. Brands want their products to be well represented and that includes visual presentation. Are you taking crisp, bright photos? Are you thinking about how you style a product or incorporate it into your imagery to compliment your post? Think about it this way: every photo you publish in a sponsored post should be one that a brand would want to use on their own social media platforms. That doesn't necessarily mean it needs to be a pro photograph but it does mean that it needs to be well lit, clear and sharp. What makes your blog stand out from the crowd? Do you write in a sassy tone or speak deeply, from the heart? Do you write from the point of view of a stay at home parent or working parent? Do you have littles, multiples, teens, or a husband who acts like one? Are you a single girl out on the town? Or a newlywed couple living on a budget? Your tone, style and content will drive which brands will be a good fit for your blog so develop it and create a space in the blogging world that is uniquely your own. Ultimately, a brand is paying you to share their product in order to create awareness or drive sales with your people. So, who are your people? Do you even have people? Dig into your analytics and figure out who is reading your blog. Reply to their comments and get to know your readers. Find other bloggers who are in your niche and support them, learn from them and strengthen your community. And though it may seem like it, a following isn't necessarily all about numbers. If you have a dedicated following who believes in your content, then you've hit the jackpot. If you have the answers to these 5 questions then I have really good news for you: you've officially built your first pitch! By building a content library, knowing who you are as a influencer, what your style, niche and platform are and who makes up your audience, you have everything you need to present your site to a brand. Now go forth and monetize! 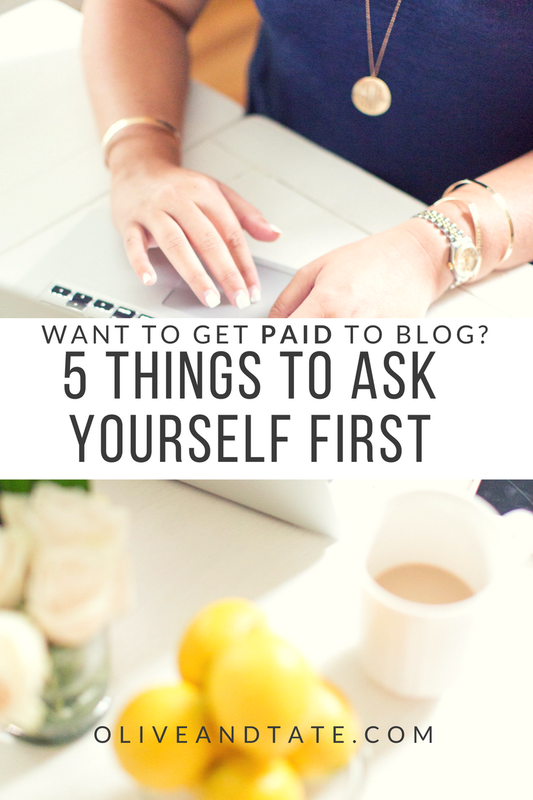 Do you have more questions on the business of blogging? Check out this post on how to work with fellow bloggers! All such great tips!! I need to work on my photography game but dang it's a pain lugging that big camera everywhere! Great tips, Stephanie. I just started my blog over Labor Day (I am WAY late to the blogging party). I definitely don't see myself as a future full time blogger, but I might be interested in semi-monetizing parts of my blog eventually so I am going to pin this article for future reference! One thing I especially love about your blog is that you are real and genuine. It really bothers me when I can tell a blogger is reviewing something just for affiliate links or does a sponsored post for a different "must have" every single week that I doubt they are actually using. I need to up my photography game. Any favorite camera suggestions? Have you ever considered doing a blogger photography course or organizing a course on taking and arranging beautiful photos? I would for sure attend!